On Tuesday, the Dodgers became the first team in baseball history to open a World Series with their four leading home-run hitters on the bench. On Wednesday, they did it again. L.A. is now down 0-2, and is hitting just .175 in this World Series, and has just one measly extra-base hit. It’s possible the Red Sox merely needed to start a pair of lefties, any lefties, for the Dodgers to go ahead and beat themselves. Cody Bellinger, Max Muncy, Joc Pederson, and Yasmani Grandal have been out of the starting lineup for each of the first two games of this series, as the Dodgers have gone with all-righty lineups against lefties Chris Sale and David Price, because Dave Roberts and the front office really, really like to play the match-ups. Pederson has a huge split against righties versus lefties, and Grandal has been woeful both at the plate and behind it, so their exclusions make sense. 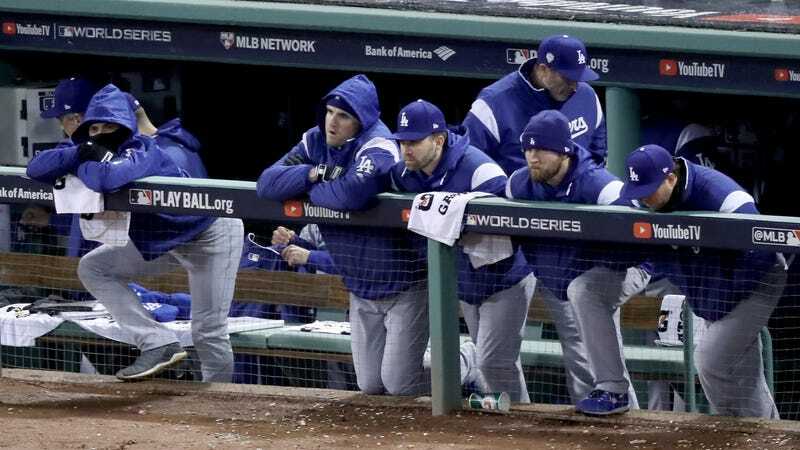 But it’s verging on the unforgivable for Bellinger, the NLCS MVP, and Muncy, who’d have the third best OPS in the NL if he had enough at-bats, to be watching from the dugout as the Dodgers struggle to put men on base. The Dodgers have played the platoon advantage to their favor all season, and in the NLCS against Milwaukee. The problem is that Roberts is treating Boston like Milwaukee, which it most definitely isn’t. The Brewers were quick to pull the trigger on pitching changes, and loved to play the match-ups themselves, so there was usually ample and early opportunity for Roberts to go to his bench. Not so with the Red Sox, who use their starting pitchers like, well, starting pitchers. Roberts has been forced to wait to put in his sluggers until the later innings, after they’ve already fallen behind. In Game 2, Muncy first came to the plate in the seventh, and Bellinger and Pederson in the eighth. It all amounts to fewer at-bats for L.A.’s best hitters, and I don’t care what the righty-lefty splits say: that’s not optimal baseball. Bellinger and Muncy have combined for just six plate appearances through two games. Their righty stand-ins, Kiké Hernandez and Brian Dozer, have had 12. They’re 0-for-10 with two walks. It would be one thing to play the match-ups if the righties were hot, but they’re not. Dozier, acquired at the deadline specifically to give L.A.’s lineup more depth against lefties, batted .182 in the regular season after joining the Dodgers and is .133 in the playoffs. Hernandez is 3-for-35 in the postseason. “With Kiké, he’s a guy that has come through in a lot of big moments for us,” Roberts said after Game 1, and it’s hard not to hear that as a callback to his heroics in the 2017 NLCS, which was more than a year ago. Or, put another way, as sentiment being a reason for his inclusion in the lineup. All of this now amounts to a moot point, as the Red Sox will start righties Rick Porcello and Nathan Eovaldi as the series moves to Los Angeles, and Roberts will be able to put his lefties back in his lineup. But when Sale’s turn comes around again—if it does—he’ll have some big decisions to make. By then it might already be too late.